Lewis L. Lacey was born in Montreal, Quebec, in 1887, the son of William Lacey, a professional cricket player. In 1891, when the Hurlingham Club was established by the British colony outside of Buenos Aires, William Lacey was hired as the club’s cricket coach and groundsman. And so Lewis Lacey, toddler and Canadian citizen, was off to Argentina. At the Hurlingham Club, William Lacey threw himself into his work as coach and grounds-keeper, but also as an architect, builder, manager and sportsman. And on Hurlingham’s polo field, young Lewis (Luis) Lacey learned the game that would make him famous in South America, North America and Europe. Lewis Lacey was not a large or powerful man; histories characterize him as small or “slight.” (In 1930, Charles Parker took this to an extreme by referring to Lacey as “that pint of polo poison.”) But Lewis Lacey rode in harmony with his horses and struck the ball hard and true. His first win in the Argentine Open was in 1915, but he put polo aside at the start of World War I. Having been born in the British Commonwealth, he enlisted in the King Edward Horse Regiment. 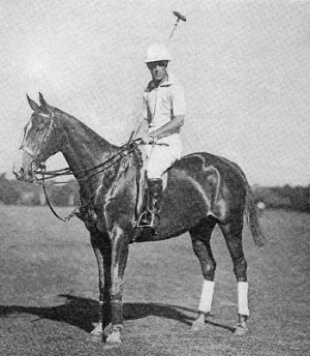 After the war, he returned to Argentina and picked up where he’d left off, winning the Argentine Open in 1920 and ’21, and earning polo’s highest ranking, 10 goals. In all, Lacey won the Argentine Open eight times between 1915 and 1937; England’s Coronation Cup twice, the Hurlingham Open twice, the Roehampton Open five times. He played for Britain in the Westchester Cup series and for Argentina in the Cup of the Americas. He declined a chance for Olympic gold in 1924, since he did not wish to play against Great Britain or Argentina. The first dates from 1920, when Lacey opened a men’s shop in Buenos Aires and began selling a polo shirt embroidered with the image of a polo player, a design that originated at the Hurlingham Club where Lacey had learned to play polo, and where the shirts were soon worn in play. This was, if you care to count, 19 years before the birth of Ralph Lauren, and 52 years before Lauren marketed a shirt embroidered with the logo of a polo player. The second story concerns a horse, Jupiter, that Lacey put up for auction after the 1928 Cup of the Americas in the United States. The buyer was John Sanford, father of 7-goaler Laddie Sanford, and the price was $22,000, an eye-popping sum at the time. Sadly, Laddie was unable to handle Jupiter. Only Lacey, who was a superb horseman, really could, and so the Sanfords loaned Jupiter to Devereux Milburn, a tower of strength who showed the difficult horse who was boss by breaking its jaw. Jupiter, happily, recovered and spent the rest of his days out to pasture at the Sanford’s Hurricana Farm outside of Amsterdam, N. Y., never to be ridden again. After his last tournament win in 1937, Lewis Lacey spent the rest of his life in Argentina, in polo, coaching and teaching. He died at his home in Hurlingham in 1966, on the eve of the Cup of the Americas. The main polo field at the Hurlingham Club is named in his honor. A Canadian citizen all his life, a star for both Britain and Argentina, claimed with pride by three nations, Lewis Lacey is now in the U.S. Polo Hall of Fame, as well he should be. Please, do you know if Lewis Lacey was also famous for breaking his mallet in a key shot ? There is a Paul Brown etching I think is of him, same face but looks taller , (of course he is on a short Polo Pony ) The Broken mallet is still up in the air with the horizontal part about to fall off . Please let me know if this sounds like him There May be no photo, as Paul Brown himself had a photographic memory when he watched horses perform in any sport .